With a surging interest in artisan food, a desire for the simple life and a common hankering for hard-to-get foods from home, a few expats here might daydream about running a farm. For most, it stays that way. But former university teacher Doug Huffer took the plunge. Now he spends his days cutting growth from nearby hedges and riverbanks to feed to Stella, Sarah and Bianca and the rest of his small milk herd. 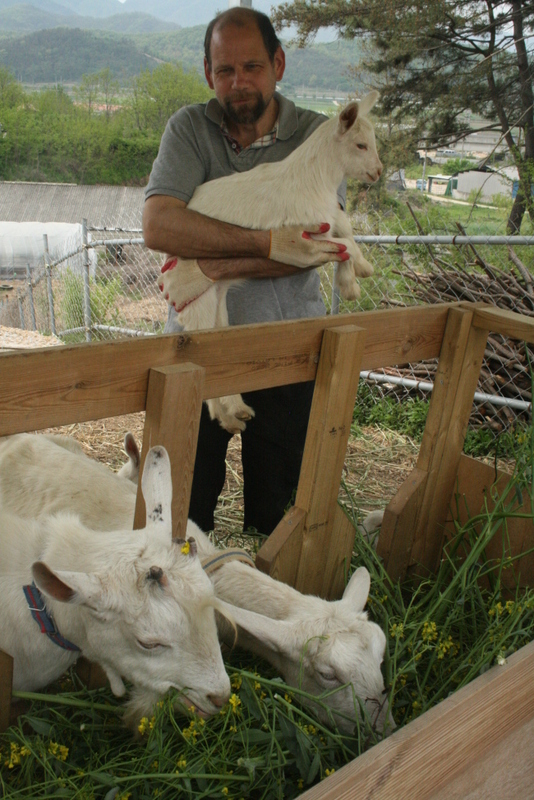 The goats’ Italian names are a hint at the farm’s origins. Huffer’s wife went to school in Italy, where she acquired the love for good cheese that she shares with her husband. After getting a traditional house in the countryside, the two decided to buy some goats ―- though they had to wait to move again, as their landlord was worried that the new tenants might eat the house itself. The two began cheese production in 2012 under the Waeg Farm label, making soft goat cheese. Two years later, they now have a family of goats living on a separate plot in the mountains. It’s still a small herd, with just seven adults, but growing with after the addition of new kids. The new arrivals have temporarily held back cheese making, but full production will return the kids are fully weaned. The lack of milk goat farms in Korea makes it difficult to find a buck with a good milking pedigree. Huffer said that one farmer wanted 300,000 won ($290) just to let his buck mate with his herd. Another told him that it wasn’t important in terms of kids who the buck was. The lack of milk goat farms also leads to a lack of support. The goats usually manage the kidding by themselves, but if he needs advice, Huffer’s main source of help is a local man who used to own goats. In the end, Huffer purchased a buck he was happy with, but to avoid inbreeding in his herd he will have to trade him in soon. “I think if I ever get enough money I will get a new buck in from Australia,” he said. He also plans to raise one of his new kids as a buck, but if he gets more he might keep them for other uses. It hints at a situation Huffer speaks on later. The farm also has some fields. So far the crops have been mostly used on the farm or at home, including a bumper crop of okra. But this year he is planning to grow several crops that are hard to come by in Korea, particularly Mexican ingredients like tomatillos, jalapenos, habaneros and cayenne peppers. While that may be another source of income, and his wife teaches children, Huffer has given up teaching and now works full-time on the farm. And he certainly seems dug in for the long term. The lease on the farm lasts 10 years, but Huffer indicated that the herd could increase quickly, outgrowing the plot before the lease is up. He also plans to diversify his products, planning to make yogurt this year when milk production fully resumes and eventually other cheeses when he gets a cheese cave to age them. For more information or to order from Waeg Farm, visit the Waeg Farm Facebook page or www.waegfarm.com.